This alert is the development of our previous alert in Palawan. The proposal to convert 8 million hectares of Philippine soil into oil palm plantations has made headlines across the country. Palawan, also known as the Philippine’s ‘Last Frontier’, is witnessing one of the highest rates of conversion of land into oil palm estates. As agro-business firms push through into the last ecological frontier of the Philippines, indigenous peoples and farmers are trying to halt them in various ways. Find here a global call for European Parliament to halt the devastating impacts of EU biofuels policy on people and the environment. Almost 200 civil society organisations from across South East Asia and Latin America have signed this call. Ramon Paje’s proposal to convert 8 million hectares of Philippine soil into oil palm plantations has made headlines across the country, and has shed some light on how the Secretary of the Department of Environment and Natural Resources (DENR), conceives development for his own country (Please see this article). Palawan, also known as the Philippine’s ‘Last Frontier’, is witnessing one of the highest rates of conversion of land into oil palm estates. As agro-business firms push through into the last ecological frontier of the Philippines, indigenous peoples and farmers are trying to halt them in various ways. One of their most recent moves has been the submission of a petition calling for a moratorium on oil palm expansion province-wide. The petition, signed by more than 4,200 farmers and indigenous people, was submitted on 29 September to Dennis Socrates, Palawan Vice-Governor, by the members of the newly established Coalition against Land Grabbing (CALG). CALG members were introduced to the Vice-Governor by Bishop Pedro Arrigo, who personally endorsed the petition. Oil palm development should never have been initiated in Palawan. In fact, in the late eighties, because of its unique biocultural diversity, the whole province was declared to be a ‘Man and Biosphere Reserve’ by UNESCO. 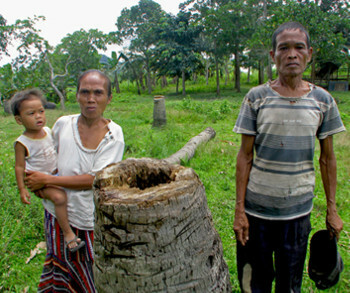 More than two decades later, massive conversion of land into oil palm plantations is endangering biodiversity, water resources, the quality of topsoil, and the livelihood of indigenous peoples and traditional farmers, while also undermining Palawan’s local food sovereignty and exacerbating rural poverty. Palawan has the last remaining contiguous forest block in the country: oil palm plantations are breaking the contiguity between differing and interrelated ecosystems, such as hilly forest, lowland forest, shrub/grassland and wetlands. This is having adverse effects on animal species that move and thrive in different ecological niches, as well as on the integrity of indigenous community conserved areas (ICCAs). Members of indigenous communities in the oil palm impacted municipalities are complaining that common animals have completely disappeared from the impacted areas and the population of birds has dropped dramatically. A recent ALDAW (Ancestral Land/Domain Watch) study, supported by Non-Timber Forest-Exchange Programme and Broederlijk Delen, revealed a remarkable decrease in numbers of non-timber forest products and medicinal plants in these areas. These are essential to the livelihood of the local communities. Moreover, due to oil palm development, fresh water resources such as fish, shells and shrimps are also fast declining. Not only has oil palm development had a negative impact on indigenous communities, it has also deprived local farmers of agriculture income. As Motalib Kemil (CALG’s Chairman) explains, “all benefits of oil palm development are being enjoyed by Agumil Philippines, Inc (AGPI) and its sister company, the Palawan Palm & Vegetable Oil Mills Inc (PPVOMI), while farmers’ cooperatives and small land holders are now on the verge of economic collapse”. the depletion of bamboos and other NTFPs. Kemil explains that those bearing the risk of crop failure are the farmers’ cooperatives and they are also blamed by AGPI if plantations do not bear enough fruits. CALG’s secretary Welly Mande speaks passionately on how his people (the Tagbanua and farmers of Barangay Aramaywan, Quezon) were seduced by the “sweet talk and empty promises” of AGPI, to the extent of entering into agreements with them. These agreements were written in technical English, which is incomprehensible to local farmers who signed them mainly on the basis of the optimistic prospects being presented to them by AGPI’s managers (e.g. long term employment and quick economic profits). Such explanations did not match what the contracts actually stated. “It is clear that Agumil has engaged in deceptive and clearly fraudulent conduct to obtain large tracts of land from local communities in Palawan” says Atty Awat, CALG’s legal counsellor. Farmer indebtedness to both Agumil (AGPI) and the LandBank (LBP) appears to have been enshrined into oil palm development schemes since their very inception. The LBP offers 80% financial assistance while the remaining 20% must be provided by the borrower. For newly formed cooperatives, having little experience and no capital, it is almost impossible to provide their financial contribution. However, AGPI has found ways to overcome this constraint, by lending capital to the cooperatives to secure the LBP loan of 80%. According to farmers, they were not informed by AGPI that a compound interest rate of 14% would be applied to the capital that they were loaned. As a result, cooperatives now have double loans, from both AGPI and LBP. Many farmers fear that they will continue to be indebted for the entire duration of the project (30 years), and that their land titles, being withheld by LBP for ‘safekeeping reasons’, may be used as collateral against their loans. “We are witnessing in Palawan to a new aggressive land grab, driven by growing global consumption of palm oil, with agribusiness enterprises taking over with the support of complicit government officials while local communities are deprived of critical resources and virgin forest is being felled down” says John Mart Salunday, the Community Organizer of ALDAW (Ancestral Land/DomainWatch), the local organization that has been at the forefront of the struggle against oil palm expansion. In the course of a joint field visit carried out in January 2014, by ALDAW and the Community Environment and Natural Resources Office (CENRO), in the Municipality of Bataraza, it was ascertained that 19.21 ha of virgin forest found on Alienable and Disposable Land (a DENR classification of public land that is not needed for forest purposes) and 2.69 ha of virgin forest found on Timberland, had been clear cut, allegedly by AGPI, to create space for oil palm plantations (see Annex 1). In the Municipalities of Quezon and Rizal, CENRO has also established that oil palm plantations have encroached on 94.2930 ha of virgin forest found on Alienable and Disposable Land, and on 185.2398 ha of Timberland. Forest conversion into oil palm plantations has also occurred in other municipalities (see Annex 2). AGPI and its sister company PPVOMI have never obtained ‘tree cutting permits’ from the DENR and thus their operations have flagrantly violated the DENR forestry code and, in particular Executive Order no.23 (the nationwide ban on the cutting of trees in natural and residual forest). Up to now, the Palawan Council for Sustainable Development (PCSD) has remained silent with respect to the environmental damage caused by oil palm plantations. The PCSD is the government agency in charge of the sustainable development of the whole province, through the implementation of the Strategic Environmental Plan (SEP) for Palawan Act (Republic Act 7611). This mandates that no development project should take place in Palawan unless the proponents first secure a so-called ‘SEP clearance’. Except for one SEP clearance issued to PPVOMI for its nursery and oil mill area (about 13 hectares), there have been no SEP clearances issued for any of the remaining thousands of hectares of land currently being converted into oil palm plantations. In allowing this development without the necessary SEP clearances, PCSD has failed to implement the law that it is mandated to uphold, thus placing Palawan’s natural and cultural heritage at great risk. “Here in Palawan” says Marivic Bero (CALG’s Secretary General) “we have the best laws in place to protect both the environment and the rights of our indigenous peoples. However, the limits of law lie within the implementation process, wherein rules and regulations are conditioned by the inability of concerned government agencies and their officials to stand by their own mandates”. This gap between law and practice has allowed oil palm plantations to expand, even in the absence of maps and permits. In a letter dated 15 August 2013, the Palawan Provincial Office of the National Commission on Indigenous Peoples (NCIP), stated that oil palm plantations overlap with the ancestral domains of Tagbanua and Palawan tribes, in at least 16 barangay (administrative districts) from five municipalities (see Annex 3). The AGPI oil palm company has been formally requested by NCIP Palawan to comply with Section 59 of the Certificate of Precondition of the Indigenous Peoples Rights Act 8371 (IPRA), and to coordinate with the NCIP Provincial Office. To date, AGPI has failed to reply to the NCIP request, however, NCIP has also failed to follow up on their initial letter. The notion of Free Prior Informed Consent is not only a central component of the IPRA law, but it is also enshrined in the United Nations Declaration on the Rights of Indigenous Peoples (UNDRIP), which sees the Philippine Government amongst its state signatories. In Palawan, the largest oil palm operations are run by Palawan Palm & Vegetable Oil Mills Inc. (PPVOMI) and its sister company Agumil Philippines Inc. (AGPI). These companies were established through a joint venture between Filipino, Singaporean and Malaysian investors, and they also engage in the processing of palm oil. About six thousand hectares of land have already been converted into oil palm plantations and plans are in existence to expand this to meet an estimated target of 15,000-20,000 hectares. PPVOMI, which is 60% Singaporean and 40% Filipino-owned, sells 100% of its production to AGPI. AGPI operates an oil mill in the barangay of Maasin, Municipality of Brooke’s Point, for the processing of crude palm oil (CPO) and palm kernel oil. AGPI, which is 75% Filipino-owned and 25% Malaysian, also exports most of its production. According to its president, AGPI sells its CPO and kernel oil to Tropical Oil in Singapore, a subsidiary of Cargill, which acts as a broker for further sales. Unofficial sources also confirm that CPO produced in Palawan is shipped, via Agusan del Norte in Mindanao, to refineries in Sabah, Malaysia, and 70% of the total production is exported to Singapore, China or Malaysia. “Indeed, this is surprising” says an ALDAW activist “since the Provincial Government of Palawan has always claimed that the proceedings of palm oil manufacturing in Palawan would mainly benefit local Palawaños and, the Philippine domestic market as a whole. They have lied to our people and now we must make them accountable for their lies”. While AGPI and its sister company PPVOMI, are left unrestricted to sell Palawan-produced crude palm oil (CPO) to Malaysian buyers across the ocean, local farmers have nothing with which to feed their families, and nothing to sell in the local market. “Agumil does not even allow us to intercrop cassava on our land which has been converted into oil palm plantations” says CALG officer Jerry Azucena “they have destroyed the lives of our families and, soon or later, they will have to compensate us for the damage”. It is well known that industrial cultivation of oil palms in Palawan is not for local consumption, but is for export, and that it is geared towards quick profits. “What we would need instead” says CALG’s secretary Welly Mandi “are lower risk models of agricultural development that give a greater share of benefits to the poor while improving and fostering the production of endemic crops such as coconuts”. Diverting agricultural production away from growing staple foods and coconuts towards oil palm cultivation is clearly an irresponsible choice that will jeopardize the future of coming generations. At the moment, the Indigenous Peoples’ and farmers’ call for a moratorium on oil palm expansion is the only tangible and immediate solution available to reverse this trend and halt the crisis. The Provincial Government must be encouraged to listen and take proper action with all haste. CENRO report on forest clearing for oil palm conversion in Sandoval, Municipality of Brooke’s Point. CENRO report on forest clearing for oil palm conversion in the Municipalities of Quezon and Rizal. NCIP letter to Agumil Philippines, Inc. Either as an individual, or your organization, write a separate letter (suggested text here) and send to these postal addresses of the politicians listed.